Tides Marine RPB Type G units are designed to be installed in rudder tubes which have been laminated or welded into a vessels hull. 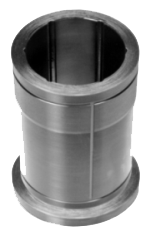 These units are simple bearings and do not provide a sealing function. Type G units have a flange. They may be used on power boats and sailboats. To improve the strength of the bond between these units and the rudder tube, external bonding grooves are machined into the OD of each part. The units consist of a one-piece UHMW housing which has fluted, self-cleaning grooves running axially along the ID of each part. They eliminate metal-to-metal contact and the associated problems of abrasion and electrolytic corrosion. They eliminate chatter and vibration resulting in quieter, smoother operation.